I had been to Macau Gallery before my Macau trip in early July. Macau Gallery is located at Bukit Peringgit in Malacca. 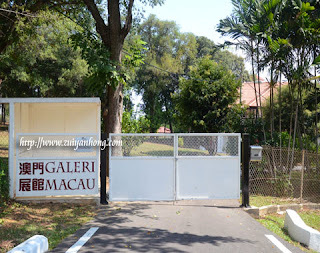 The buildings near to Macau Gallery are residence of VIPs and Malacca government senior officials. Macau Gallery was closed on that day. The only thing I could do is to take some photos outside the gallery. I have no idea about the exhibits in the gallery. 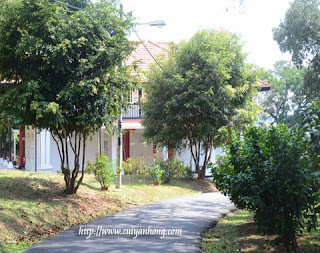 Malacca government plans to make that area as an International Gallery Centre. What a pity, Malacca government is rather slow in this project. Besides Macau Gallery, Cuban Gallery and Institute of the Arts Melaka are also available at Bukit Peringgit. Both of Cuban Gallery and Macau Gallery were established in 2007 and 2009 respectively. Do not know the set-up date of the Art Institute of Malacca.